Shopping for Captain America Statues? From the Captain America: The Winter Soldier film! 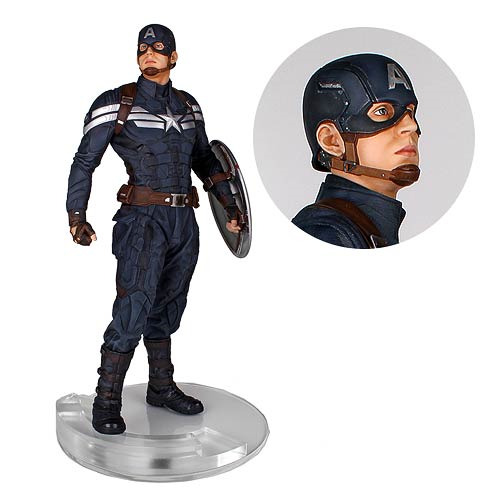 Highly detailed statue of actor Chris Evans as Captain America in his stealth S.H.I.E.L.D. outfit. Measures a whopping 18-inches tall in the 1:4 scale! Straight off the screen from 2014's Captain America: The Winter Soldier, it's Captain America! Boldly depicted in the specialized S.H.I.E.L.D.-issue stealth outfit featured in the film, this fantastic Captain America The Winter Soldier Captain America Stealth 1:4 Scale Statue is based on the actual digital scan data of actor Chris Evans, his costumes and props, making it the most authentic and screen-accurate collectible available. Each limited edition hand-painted piece is rendered in high quality polystone and comes individually numbered with a matching certificate of authenticity. A perfect companion piece to the Captain America the Winter Soldier Black Widow 18-Inch Statue (sold separately), the Captain America Winter Soldier Statue measures in the 18-inch tall scale and is a must-have for fans and collectors alike! Ages 17 and up.